The modern man deserves understated yet incredibly detailed jewelry that accentuates his personality no matter the designation. If this sounds like you or your special someone, look no further than our tungsten men’s fashion ring with white carbon fiber inlay. Not familiar with tungsten as a material? While traditionalists still favor precious metals, there’s a growing demand for alternative materials. Tungsten is a rare and exotic metal with a permanent polish that can stand up to the wear and tear of a busy or active lifestyle. Each 8mm tungsten men’s fashion ring with white carbon fiber inlay is peerless in quality and will maintain a luxuriously shiny finish for a lifetime. Looking for a designer ring that’s distinctively masculine and perfectly practical? 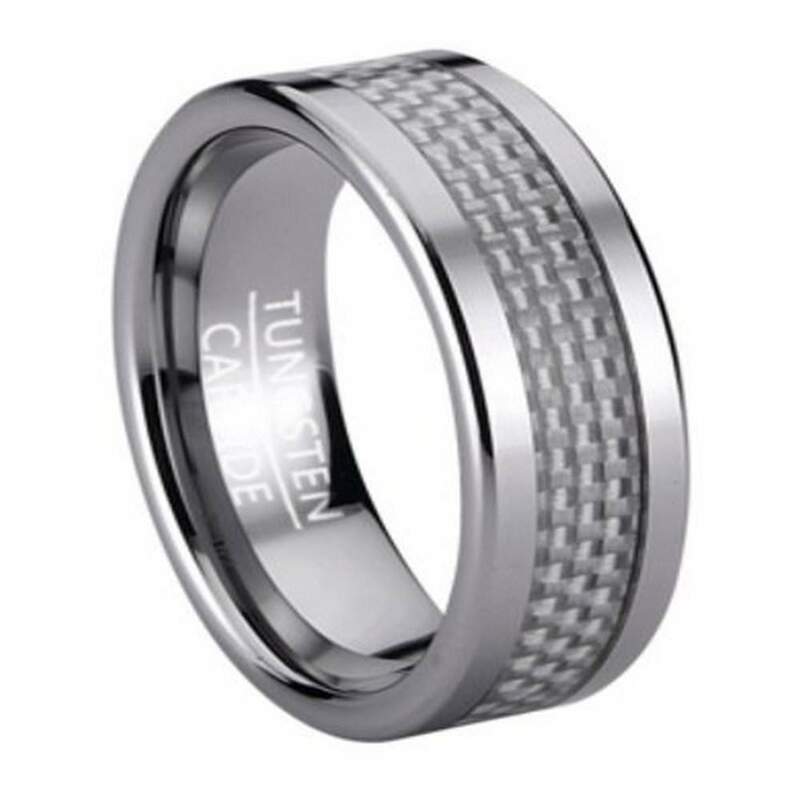 Our tungsten men’s fashion ring with white carbon fiber inlay is subtle yet show-stopping. We guarantee you’ll turn heads and add an instant appeal to your everyday wardrobe or evening attire. The carbon fiber inlay adds a unique geometric pattern that adds dimension. Best of all, each 8mm tungsten men’s fashion ring with white carbon fiber inlay comes in a comfort-fit design, with a slightly domed profile made from extra material so you stay comfortable all day long. Comfort fit rings usually measure a half size smaller than traditional fittings, so we recommend that you have your finger measured at your local jewelry store to ensure that a comfort fit fashion ring is the right choice for you and your lifestyle. Comfort fit tungsten rings usually run 1/2 size larger, it is suggested you buy a half size smaller than your standard ring size. We recommend having your finger measured for a comfort fit ring at your local jewelry store for an accurate fit. All of our tungsten rings come with a lifetime warranty. This was the third ring my finance and I finally decided we loved! We ordered it online, with no problems, and received the ring in only a few days. It fit him perfect according to his ring size, and is really comfortable. The best thing about it is with his line of work any other band would be scratched up. Due to the material of this, it is resilient to all of the wear and tear of everyday. Would definitely make another purchase down the line. Thank you!!!! The ring was beautiful! Very low priced and great quality!